Immunogen :IKK alpha antibody was raised against a peptide corresponding to amino acids 716 to 734 of human IKK alpha, which differs from corresponding murine sequence by four amino acids. 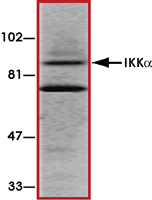 Sample Data :Western blot analysis of IKK alpha in HeLa whole cell lysate with IKK alpha antibody at 1:1000 dilution. 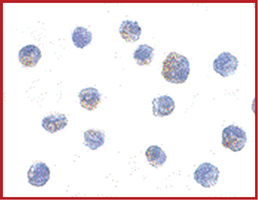 Sample Data :Immunocytochemistry of IKK alpha in Jurkat cells with IKK alpha antibody at 1ug/ml. Scientific Background :IKK alpha is a serine/threonine protein kinase that phosphorylates the I-kappa-B protein which is an inhibitor of the transcription factor NF-kappa-B complex. Phosphorylation of I-kappa-B protein triggers the degradation of the inhibitor via the ubiquitination pathway, thereby activating NF-kappa-B complex (1). IKK alpha is an essential regulator of NF-kappa-B-dependent gene expression through control of promoter-associated histone phosphorylation after cytokine exposure (2). IKK alpha is a critical component of the cytoplasmic transductional-transcriptional processor leading to induction of IFN alpha production. IKK alpha is also involved in the epidermis where it antagonizes mitogenic and angiogenic signals and represses tumor progression and metastases. 1. Anest, V.et.al: A nucleosomal function for I-kappa-B kinase-alpha in NF-kappa-B-dependent gene expression. Nature 423: 659-663, 2003. 2. Hoshino, K. et.al: I-kappa-B kinase-alpha is critical for interferon-alpha production induced by Toll-like receptors 7 and 9. Nature 440: 949-953, 2006.